Ever since I first sat down and fell for Netflix's Daredevil back in April, I've harbored this massive obsession with the show--especially its titular hero. 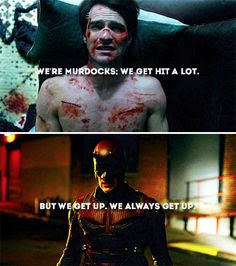 In fact, much as I love the Avengers, I kind of felt like Matt Murdock was my new favorite hero in the earthbound MCU. At the time, I figured that was partially due to the fact that Daredevil was so new, and I was on a big kick. But after rewatching the series again this week, it's official: overall, Matt is my new favorite. Here's why. 1) He's a street-level hero. While I'm all for alien attacks and rogue geniuses with state-of-the-art tech at their disposal, big-scale villains are all we've seen in the MCU so far. Compared to all that, there's something really special about Matt's quest. His battles are fought in alleys and seedy buildings, on rooftops and in old warehouses. His mission--cleaning up his childhood city--is deeply personal, and the down-to-earth nature of his objectives and methods helps ground the show. Ironically, when it's only the future of one neighborhood in the balance, the stakes in a Marvel story have never felt higher. 2) He's more human than any other hero so far. Yeah, he's got superhuman senses. But despite that, he's still the most realistic, three-dimensional, regular-guy character Marvel's given us so far. I love his fairly realistic fighting style: an exhausted barrage of sharp, light hits till he wears his opponent (and himself) down. I love that you can see the toll each fight takes on him--how he doesn't get hurt and shake it off, but carries his stitches and limp with him for days. More than enhanced senses or his carefully honed fighting skills, Matt Murdock's superpower is his ragged determination. Ultimately, he feels like a person instead of a god. Then there are his character flaws, which leads me to my next point. 3) He's the most morally ambiguous hero we've seen so far. Granted, Tony Stark isn't exactly an angel--and it's just as well we're not including the Guardians in all of this, because they're sort of thieves and outlaws. 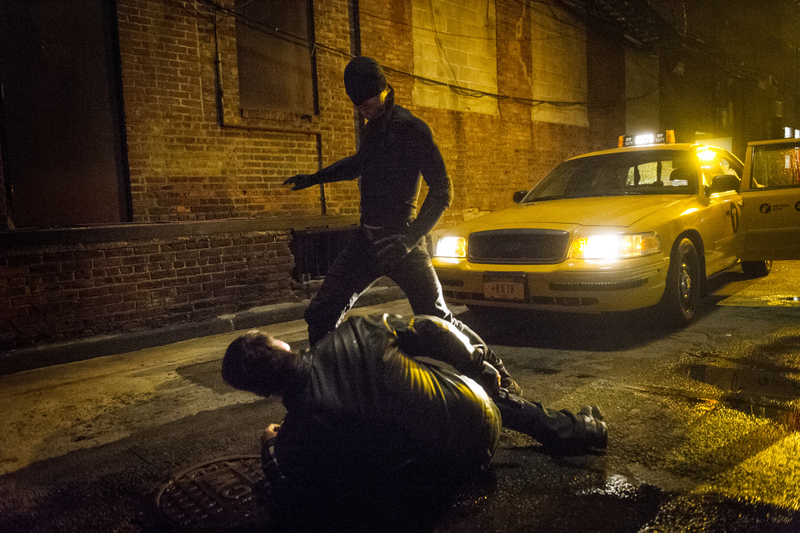 But with Daredevil, the line between hero and villain is always shifting, perpetually blurry. Sometimes, Matt's "The ends justify the means" mentality makes him look a lot like the guy he's trying to take down--and the people around him are always quick to remind him of that. Matt's inclination towards vengeance is constantly at odds with his Catholic faith, and his tendency to put his mission before his loved ones and personal life constantly wrecks his chances of happiness. 4) He's got a complex, compelling personality. This sort of echoes points raised in the discussion about how human he feels, but just like any person, Matt's a walking meat suit of contradictions. Thanks to flashbacks interspersed throughout the series, we have a real sense of how the things he's been through have shaped the person he's become--as well as the person he has to fight not to be. Matt's suffered loss after loss in his life, and he's got a dark side; sometimes he goes too far before he reigns himself back in, sometimes he's cold to the people who love him the most, and it's been questioned more than once whether he actually enjoys vigilante life a little too much. But at the end of the day, he's a decent guy trying his best in a less-than-decent world. He's reserved but charming, with a wry sense of humor and a killer sense of determination. 5) All that said, the supporting characters in his life are just as amazing--especially Jack and Foggy. One of my favorite dynamics on the show is the one between Matt and his dad. Their bond is painted in relatively few brushstrokes, but that's all we need to understand their relationship: Matt was an impressionable young kid who idolized his dad for always getting back up when he was knocked down, and Jack was a down-to-earth dad completely dedicated to his son. As a boxer, he took home more bruises and cuts than wins, but he always returned to the ring again with this dogged determination--which is clearly one of the most important lessons Matt's ever learned. 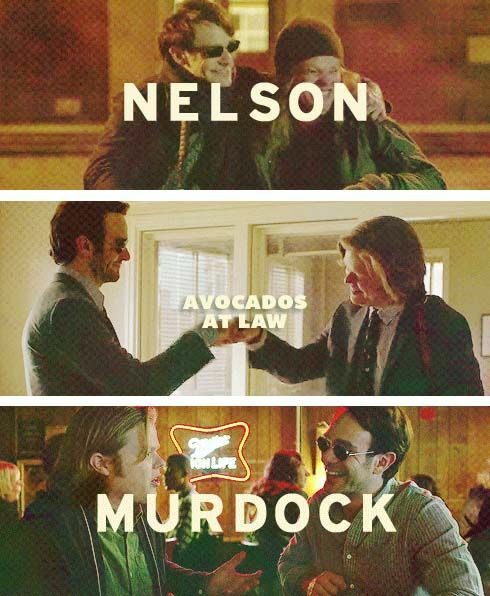 Then there's Matt's relationship with his best friend, Foggy Nelson. These two lawyers met in their college days, interned together at a soul-sucking prestigious law firm, and ultimately decided to strike out together and create their own firm to protect the little people. Through it all, Foggy's always had Matt's back. To me, it's the little things that sell their friendship the best: times when Foggy helps the blind Matt cross a street, watch for stairs, or even when he fills him in on gestures other characters are making. When Matt lets him, Foggy also helps drag him out of his shell and make him more comfortable in new situations--usually with that easy sense of humor. 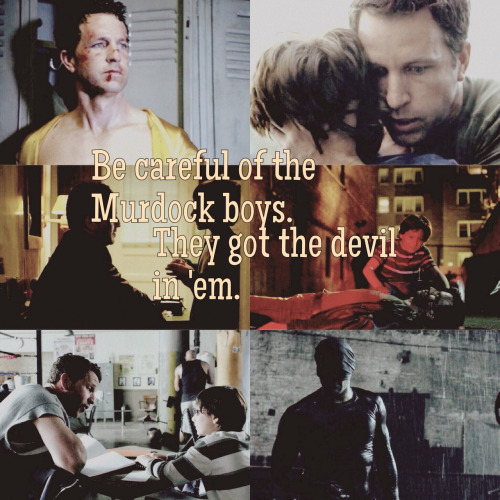 In a lot of ways, their bond is the heart of the Daredevil series, reminiscent of the simple, pre-war days of the Steve-and-Bucky friendship. It's one thing I know I'll keep going back for. There are loads of other things I love about Daredevil, but I should probably cap it off there. Out of curiosity, though, what's your favorite thing about the character? About the series? Is there a character you like more--and if so, who?